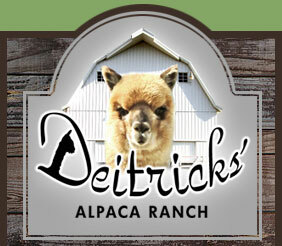 * Alpacas are members of the camelid (or camel) family. They are mild tempered, gregarious animals with an inquisitive nature and a penchant for bringing great delight to their owners. * There are two different breed-types: the huacaya and the suri. Although both types of alpacas are physiologically nearly identical, one main physical difference is clearly identifiable: the fleece. Huacaya fleece has a degree of waviness or crimp, thus giving huacayas a fluffy, "Teddy Bear-like" appearance. Suris on the other hand, have no crimp in their fleeces, so thier fiber clings to itself, forming beautiful "pencil locks" that hang down from the body in gentle, silky cascades. * Indigenous to South America, the aplaca is raised for its soft fleece. this fleece is sheared once a year, yielding roughly five to ten pounds. After only minimal preparation, it is ready to be spun into yarn or used to make felt. * Alpacas stand approximately 36 inches tall at the withers ( the area where the neck and spine come together) and weigh between 100 and 200 pounds. * They require only modest amounts of food (approximately 1 1/2 to 2% of their body weight in hay per day), plus free access to fresh water and free choice minerals. Some owners also supplement thier animals' diets with additonal grains and crumbles, based on specific nutrional needs and preferences. Alpacas have been domesticated for more than 5,000 years. They are one of Mother Nature's favorite farm animals. They are sensitive to their environment in every respect. The following physical attributes allow alpacas to maintain their harmony with our Mother Earth.